A few years ago, I was at JenJ's house and she was so generously giving me a saddle and loading me up with saddle pads for it. 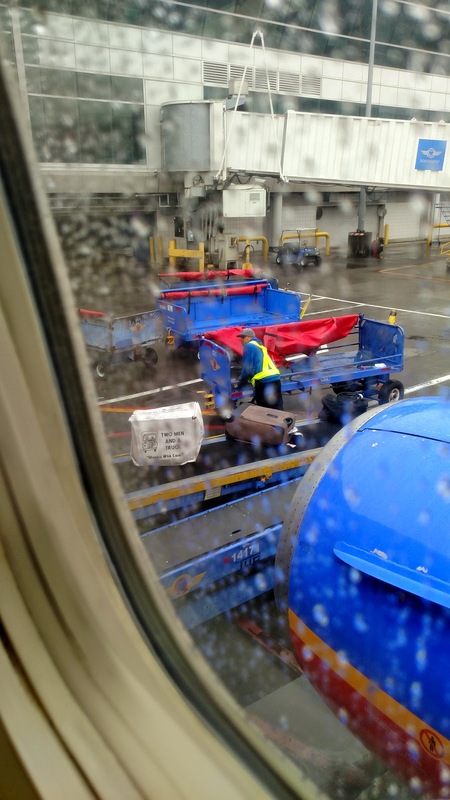 Remember that time my checked luggage was a cardboard box containing a saddle, and it rained? Good thing it was a Wintec. One of the pads in that box was quite old and clearly well-loved, but JenJ said it was too small to fit any of her current horses. Turns out it's actually hard to find photos of my schooling saddle pads that aren't blurry Pixio stills. This was during our saddle fitting festival. But the Classic Equine pad also had features I liked in addition to being the perfect size. It fit the contours of Connor's back perfectly. It has a square back corner - not a round corner, not a swallowtail, just square. And it had a velcro girth strap, so I could just open it to put the billets through it rather than wrestling them through the strap under the flap. 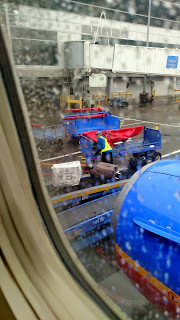 Minor, I know, but I like to drive little annoyances out of my life any way I can. But the problem? THEY DON'T MAKE THEM ANYMORE. In fact, they haven't made them for a while now from what I can tell. That's started a lifelong obsession with finding them, used, anywhere I can, and paying whatever necessary to get them. Especially since the black one has slowly started to wear in irreparable ways after I used it constantly for years. I nabbed this beige one new with tags off of a Facebook group. It's horse-sized so slightly bigger than the black one, but still fits him so much better than the horse-sized pads of today. Then last week I found a used white one for sale on eBay as part of a 2 pad lot with a Baker baby pad I will never use. The binding is coming off in places and someone wrote a bunch of stuff in sharpie on the spine, and they were asking a ridiculously high price for two used pads, but again, this is my life's quest at this point, so none of those details mattered to me, haha. I probably wouldn't be nearly as obsessed with this if it wasn't nearly impossible to find pads that truly look good on him. 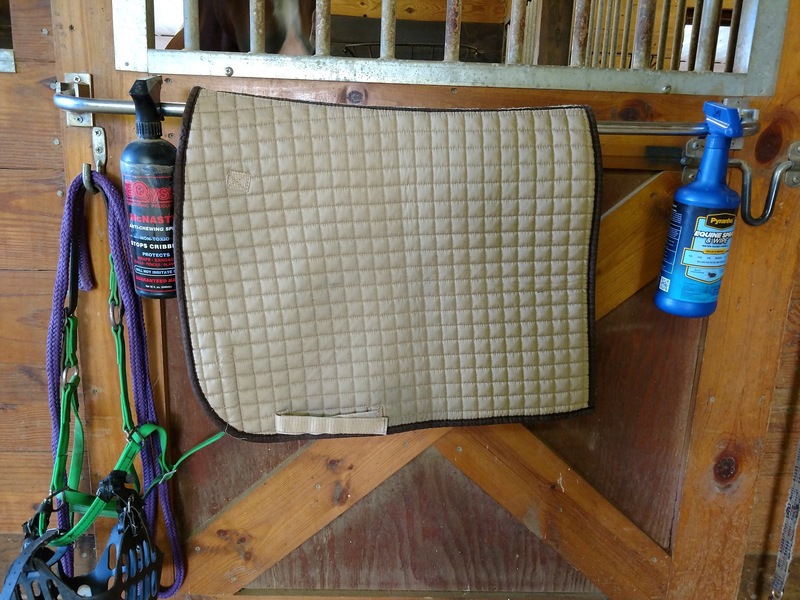 The modern warmblood pad is too big, and pony pads are too small, and no one makes hony-sized pads. The way I see it, I found something that works, they don't make it anymore, and I am on a mission to buy as many as I can. So that brings us to my ask: If any of you come across a Classic Equine Dressage pad for sale, please either let me know or buy it for me and I'll pay you back. I will pay you a finder's fee! Any color, any size, any condition, any price. Thanks in advance! I have a beige Equine Classic like the one you bought. I love it! Harley is average-sized, but my saddle has short flaps to accommodate my short legs. It fits great. I didn't realize that they were not made anymore. What a pity. Good luck on your search...or maybe you should start a cob-centered saddle pad company. Glad I'm not alone in liking these pads :) I've scoured the internet and not found any which has led me to believe they're not being made anymore. 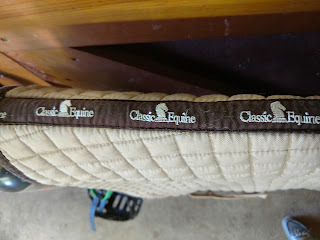 Classic Equine does make pads but they're all western. So disappointing! 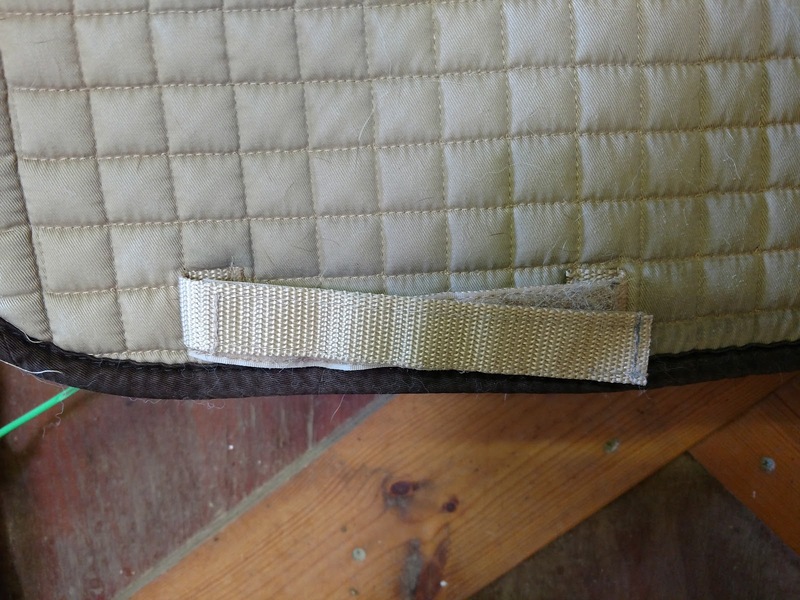 Yes I could probably make a killing on a cob saddle pad company, too bad I can't sew, haha. I'll take a look at it when I see you! Ooh, I'll have to try to hunt one of these down for myself! 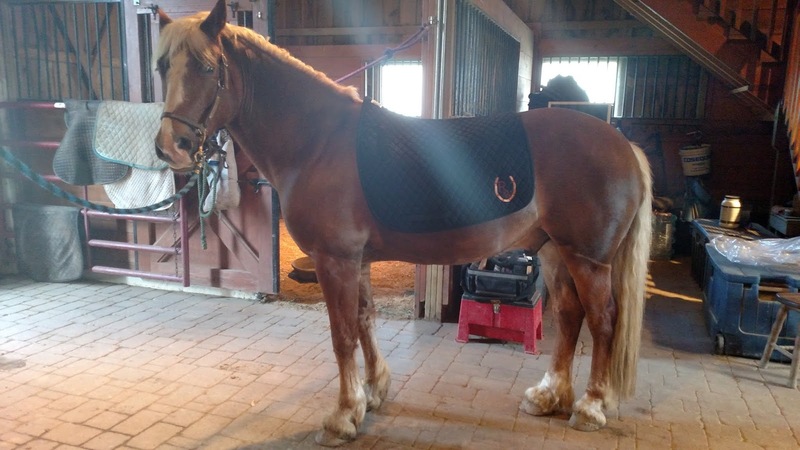 Even with Opie's latest growth spurt he still tends to look eaten alive by regular sized dressage pads. The Union Hill brand has worked best for us, but the color options are super limited which is a drag. I know people with smaller horses really like the High point shaped ones that are cut to be less massive, and PRI seems to make a nice smaller pad line? I adore the PRI felt center pads, they stay where I put them and lay nicely. Easy to clean too! I took the power washer to mine and it was amazing to get hair off the bottom. I wonder if this might work for you... 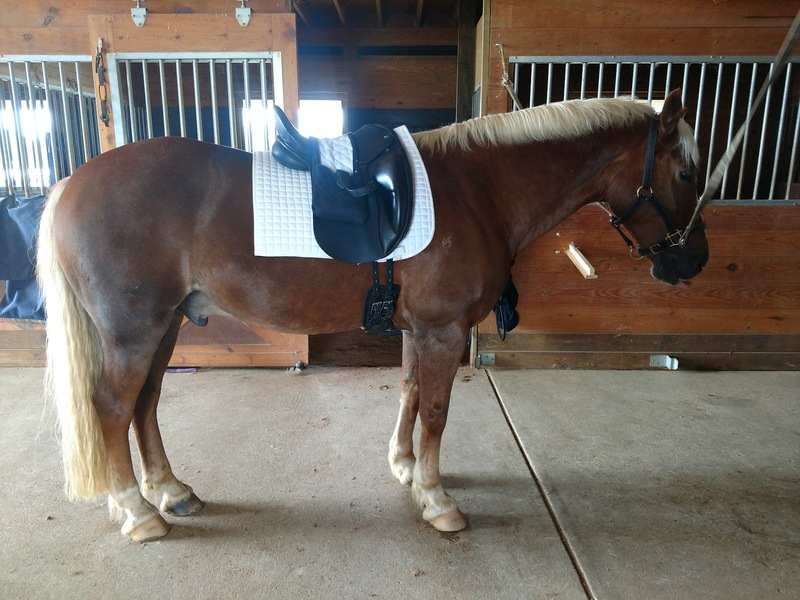 It's designed to fit saddles up to a petite 17.5"
I have that one, it's actually the one he was wearing at Pony Cup: https://4.bp.blogspot.com/-FzSrObJkefU/WXNT_ZRNutI/AAAAAAABbJY/wgn3bNALNoc5otZWwU987rkWaCXDXekDQCLcBGAs/s1600/DSC_0129.JPG It's probably the second-closest to a perfect fit in terms of size, so you're spot on with the recommendation! It's just missing the other things I love about the Classic Equine pads. These are the best saddle pads IN THE HISTORY OF THE WORLD. Source: am historian and horse person. I have two, and the gray one is in baaaaaaad shape. 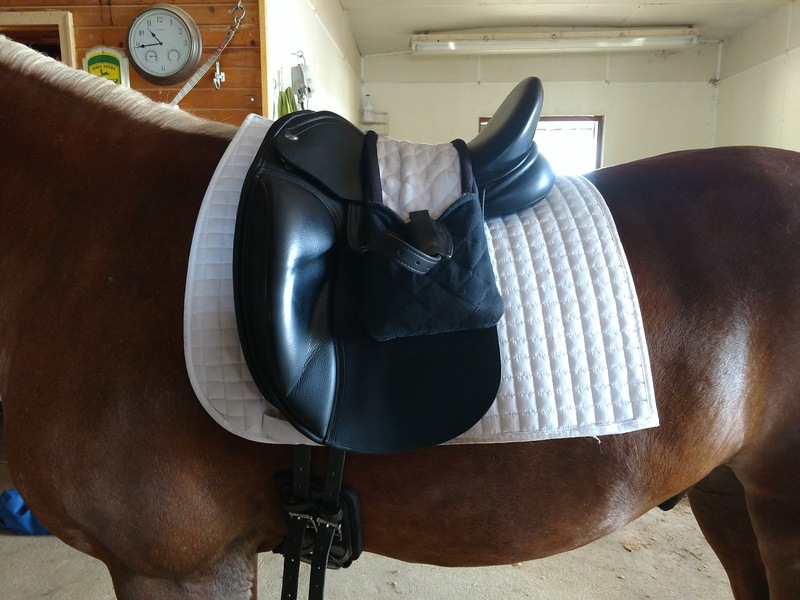 I think occasionally about copying the pattern and making my own but making saddle pads has felt a step too far for me for now. Bah. YOU'RE MY ONLY HOPE! Haha! I know you like them too and I feel a tiny bit bad snapping them up instead of telling you about the ones I find. 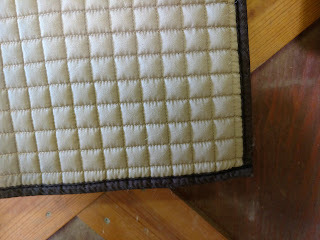 The fabric on my black one is wearing so thin on the underside under the seat that you can see the batting underneath. Do you think there's any way that's fixable or is it a goner? You might be able to sort of encapsulate it. 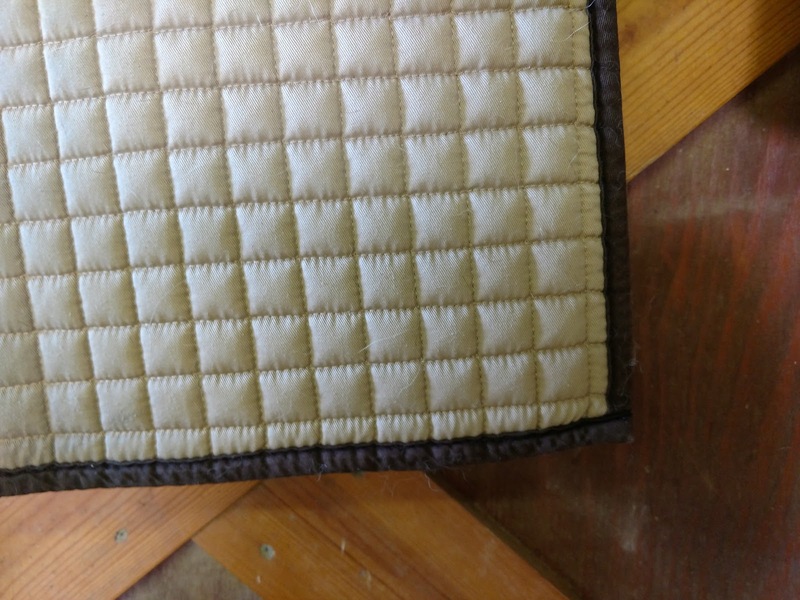 Stitching new fabric over it. I am not sure if that would make it stiffer or bulkier though. My gray one is wearing in the same way, behind the girth. I’ll watch for them as well! haha I will check the consignment trailer next time it comes to the barn. Oh no, I have one of these! But I'm selfish and won't share because it's white and the only 'show' pad I have that fits Bridget. I just checked the website I got it from and they don't carry it anymore :( Depending on your dressage saddle the all purpose ones in horse size may work - I have an ancient one that was my everyday pad for years. Also, try the BR event dressage pads - they come in cob size and fit B really well! I wouldn't pay new price but if you can find a used one to try it might be worth it. 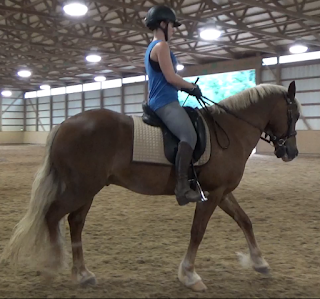 I have some AP and dressage pads that no longer fit Carmen now that she has, ahem, expanded her girth line. I wish you were closer- you could try them out. Here are the full dressage results, team and individual, with all the scores, from WEG 2018. As well as the team, and individual, eventing standing after the dressage.